Digital platforms and social networks have changed the relationship between brands and consumers. Consumers of today use multiscreen media to make life easier, simpler, and more meaningful. What can brand advertisers do to connect with these new consumers? Google partnered with TNS and Ogilvy to answer this question. What we found is simple but transformative. It's all about purpose. Brand advertising has traditionally concerned itself with touching the hearts of audiences or tickling their funny bones. Advertising used that emotional—often entertaining—connection to bond consumers to the brands they grew to love, with the courtship carefully scheduled around television seasons, divided by the time of day and dependent on broadcast media consumption. But today, digital platforms and social networks have changed the relationship between brands and consumers. Consumers have more choice than ever before and are engaged even in creating content. Reaching and engaging these new, active and connected consumers—Generation C, as we have called them before—is a constantly evolving challenge. However, for brands that embrace this challenge, it is also an opportunity to bond with people more strongly than ever. What can brand advertisers do to connect with these new consumers? Google partnered with TNS and Ogilvy to answer this question. Over a span of six months, in two different waves, we surveyed 2,458 recent purchasers of products in three categories—auto vehicles, beauty products and smartphones. New consumers are looking much more substantially than they have in the past to media to match the purpose with which they lead their lives. More than ever, this perspective helps them fulfill their needs, passions and interests. The degree to which purpose even drives their shopping and purchases is eye-opening. 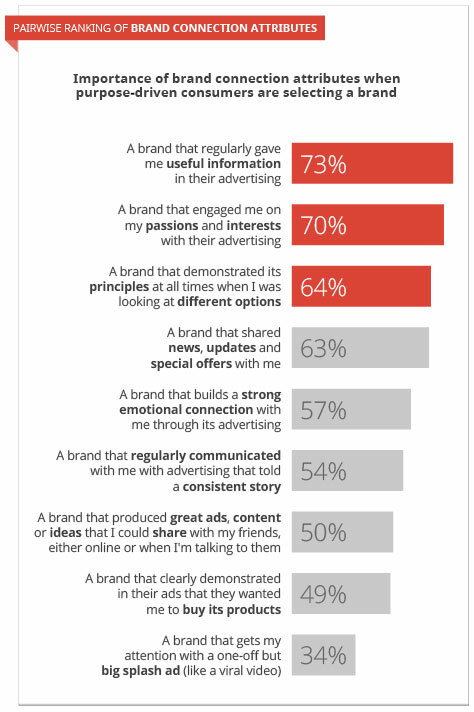 Consumers choose the brands that engage them on their passions and interests 42% more often than they do those that simply urge them to buy the product being advertised. As a result, their path to purchase is actually their path to purpose.